Hospitals, trauma centers, and other healthcare settings have an increasing responsibility to use Screening, Brief Intervention and Referral to Treatment (SBIRT) to evaluate clients for alcohol and other substance abuse. There is a need for practical and cost-effective resources that can be readily available at any teachable moment. The Ingredient for Recovery resource is a tool that can help provide this information effectively to achieve this goal. 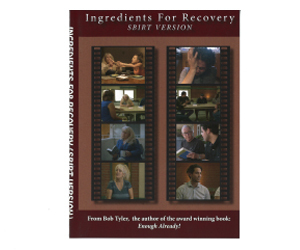 Ingredients for Recovery does not assume viewers have concluded there is a problem, but rather draws from Motivational Interviewing strategies, and educates on the common symptoms of addiction. Thus, clients receive information against which their own use patterns can be measured in determining for themselves whether or not change is necessary. Different levels of care available to treat alcoholism/addiction are explained, including access to help for those who lack financial resources, i.e. 12-step programs. Simple and specific instruction on how to utilize such free self-help community resources is provided. The information and education on 12 step programs and recovery tools allow the recipient to understand the use of this option and increases the chances for success in getting and staying sober.